Traditionally all UL listed heated mattress pads in North America operated at 120 volts. Perfect Fit Industries a premier home textiles and bedding manufacturer, designed and created this heated pad to operate with non-hazardous low voltage. This technology has allowed them to create another one of their safest heated mattress pads produced. Automatic shutoff after ten hours - Dial Control from low setting, 1-9, and high. 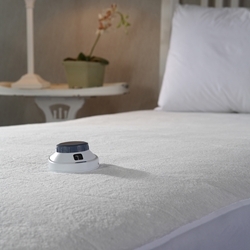 The Queen and King size pads come w/dual controls to adjust heat on each side of the bed separately. The automatic preheat feature warms to your dial setting in about 15 minutes. The blanket will deliver consistent and even heat distribution all night long. However, neither your bed nor blanket will feel hot when you touch it. A low voltage blanket will create enough heat to keep you warm. They are not designed to produce enough heat to make the bed hot like an old fashioned electric blanket. Queen and King size have 2 controllers, power supply boxes, and cords. The controllers shown may vary depending on factory changes in technology and may not be exactly as illustrated. All will fit up to a 18" mattress. Twin = 38" x 75"
Full = 53" x 75"
King = 78" x 80"
Should not be used with an electric adjustable bed or water bed. Sleep Number Beds are OK to use with this product. Do not use this product in conjunction with an electric blanket.